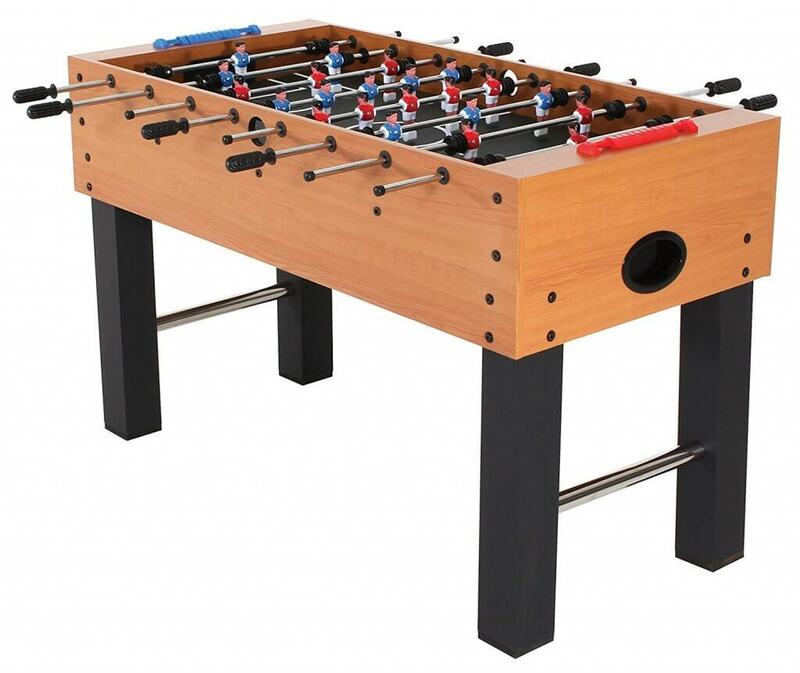 Finding a kids foosball table is all about finding a balance between size, price, and durability. Size, because most smaller kids won’t be able to see or reach a full-sized foosball table properly. Price, because you may not want to be dropping a few hundred bucks on a table that’s meant to be beat up, I mean played with, by your kids. And durability, because, well, they’re gonna beat it up. 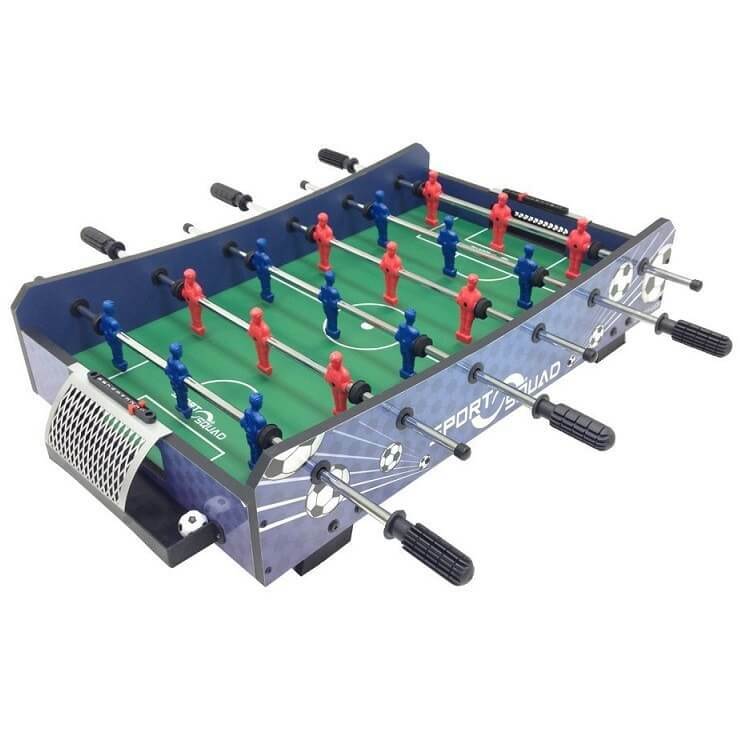 Luckily we’ve put in plenty of hours reviewing the best foosball tables on the market, and we’ve come up with the top 5 small foosball tables for kids. When it comes to fairly cheap, but fairly decent tables, Kick is just about unrivaled. 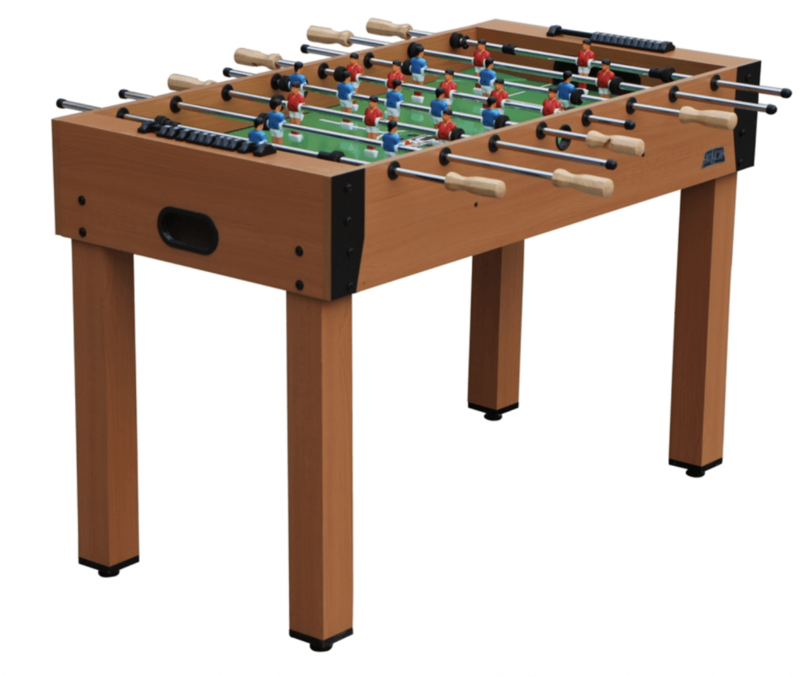 They’re the perfect brand to look for when it comes to treating your kids to a fantastic table soccer table. Not only do they play reasonably well, but Kick offers an unbeatable lifetime warranty. Their quick and responsive customer service team will be happy to assist if you need a replacement part, and will usually ship out a piece – at no charge – within a day or two. While your kids are learning how to properly respect the table, you might expect a few dents, dings, scratches, or bent poles. Having the peace of mind that comes with a full warranty FOREVER is worth more than a few bucks in my opinion. This table is only 4 feet long. Full sized tables are usually 4 feet 8 inches or thereabouts. It’s also only 31 inches tall, a full 5 inches shorter than normal tables. Those are definitely smaller than big tables, but the good thing about this table is that it’s not TOO small. It’s not like your kids will grow up and have no idea what to do on a regular sized table. It’ll allow them to hone their skills now, without being totally unprepared for the slightly larger version as they reach their teenage years. It’s also perfect for smaller spaces, and can be easily moved out of the way since it’s fairly light. We loved that it has adjustable leg levers and decent rods, so it’s not like it’s just put together using the cheapest parts you can find. It’s easy to put together, and as I said above, Kick has some of the best customer service in the game, which is exactly what you want when you’re buying a cheaper table. Some cheap tables end up being not so cheap after you buy replacement part after replacement part. Just a quick heads up, this table uses 30 mm balls, which are slightly smaller than normal foosballs. If you buy extras, just keep that in mind. If you have kids, a small space, or just don’t want to shell out a ton of money on a table, the Kick Glory is the best of the bunch when it comes to affordable game play. This is an ultra cheap table, so if all you care about is having something that your kids can play once in awhile (and you’re confident they won’t beat the absolute crap out of it), it’s a great way to get a table without breaking the bank. On the cheaper side of things, it’s as good as you’ll get. 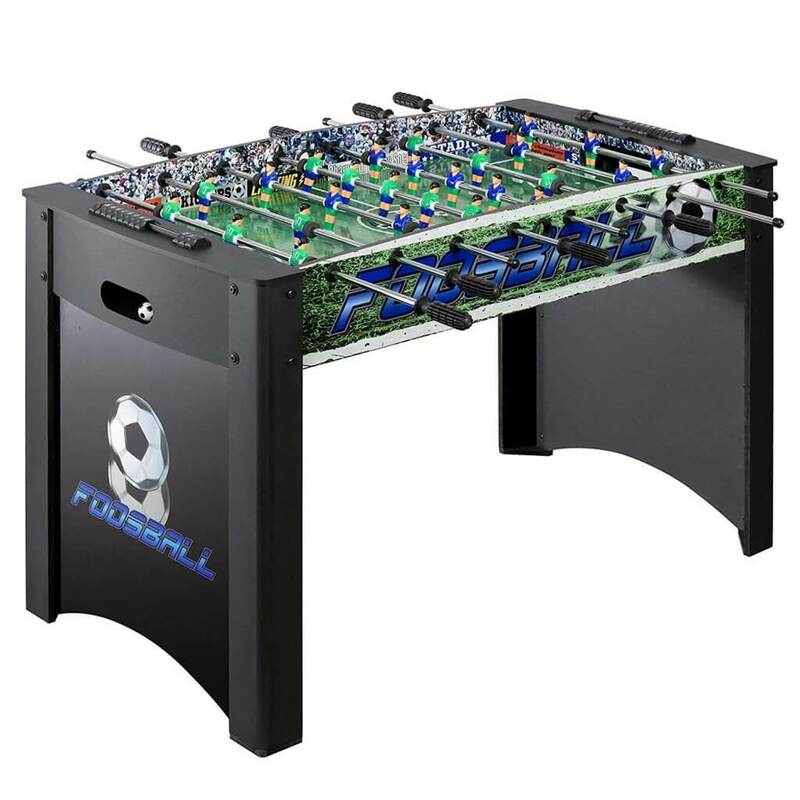 Alright, so the kids want to play some table soccer but you’re not flush with cash. What to do? You might send them tot he local arcade with some quarters, or you could buy this table from American Legend. Much better to have it in-home, right? And cheaper in the long run if they love the game. It doesn’t have any fancy features, it’s lightweight, and it is one of the thinnest tables around. That means it’s not great in terms of quality. But, if you have younger kids who want to learn to play, then this is a pretty good table. 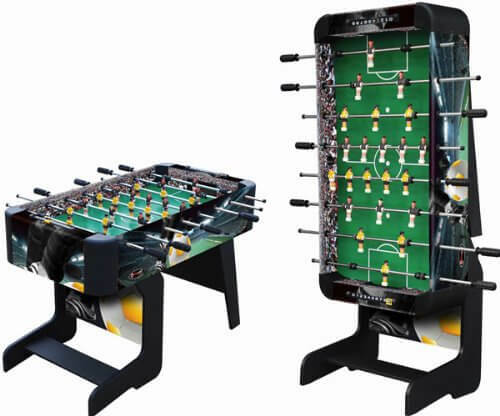 The price means it’s actually a really popular table, so you’re bound to find spare parts and a ton of reviews, which is SUPER rare for foosball tables, since they’re usually so expensive they don’t sell a ton of each model. Anyway, out of everyone we talked to and all the reviews out there, it’s safe to say most people are really happy they bought this. And while I usually do NOT rely on other online reviews, I do think they’re useful when it comes to cheap products. Sometimes cheap means that 50% of the units are garbage, and reviews will let you know if you’re gambling with your money or if it’s a good buy. If you just want the cheapest playable table (some of the cheap ones are just so bad you can hardly enjoy the game), then this is probably your best bet. Another 4 foot table, it’s obviously smaller than “full sized”, and that makes it perfect for the kidlets. It even folds up out of the way, which means it won’t take up precious space in your house if they go through a 6 month period where they never play. It should suit most kids from ages 7 through 13, and you probably won’t hate playing on it if your kid requests a match…all in all, great all around! It’s lightweight, portable, and super versatile with the folding aspect of it, as I mentioned. The rods are chromium steel, which means even though it’s cheap, they shouldn’t rust easily. While the warranty is nowhere near as good as Kick, it does still have a 90 day warranty, which is more than I would have expected for any of these smaller kids tables. It’s fairly thin, but that’s sort of par for the course at this level of table. Just make sure to tell your kids to take it easy and don’t go around bumping into the sides (they’re only 5/8 of an inch thick…compare that to 1 to 1.5 inches of thickness on a quality full sized table). Anyway, if you think you’re going to regret not buying a folding table that stays out of the way, this is a great buy both in terms of moderately good gameplay and super versatility. OK, this isn’t actually a full on foosball table. It’s a tabletop game, which means it’s tiny and has no legs. If you just don’t have the space for a real table, this will do in a pinch, and is actually a pretty slick alternative to turning on the iPad during rainy days when your kids are going stir crazy. Think of it like the mobile app version of your favorite PC or Xbox game. You may not get exactly what you want (a real foosball game), but it’s good for a quick hit if you can’t play the real thing! This is the best of the bunch of tabletop games that we found. It’s well priced, well made, and seems to last a long time, even with regular play. If you can’t fit or afford a real foosball table, this is your best option when it comes to tabletop games, and is a perfect rainy day activity for kids. Anyway, hopefully one of these picks works for you and brings joy to your kids! If you end up looking for a full sized table when they’ve grown, make sure to check out our best overall ratings here.